Tough Year Ahead for UMG Silicon Players? Makers of upgraded metallurgical silicon already have to work hard to prove their technologies work. With competitors and potential customers cutting sales forecasts, however, UMG silicon producers might find it tougher to weather the downturn. Brace yourself for 2009, UMG silicon players. The coming year is shaping up a tough one for UMG (upgraded metallurgical) silicon makers, which have been hawking their ware as the much-cheaper alternative to the purer polysilicon, the key ingredient in most of the solar panels on the market today. But a steady stream of warnings from solar companies about weak market demand and fast-declining polysilicon prices are raising questions about UMG silicon companies' survival skills. Twice in the past week, equity researcher Rupert Merer at National Bank Financial has downgraded the stock of Canada-based Timminco, one of the leading UMG silicon producers with high-profile supply contracts with Q-Cells, the world's largest solar cell maker. NBF cut the price target for Timminco's stock from CAD$20 per share to CAD$10 per share on Tuesday, after polysilicon wafer maker MEMC Electronic Materials lowered its sales outlook. Other solar companies also have reduced revenue forecasts, citing a deepening economic slump (see ReneSola's Profit up 153.5%, Stock Tumbles on Weak Outlook). Weak market demand isn't the only bad news for UMG silicon companies. After failing to meet the needs of a growing solar industry for years, polysilicon makers are finally catching up by opening new factories or expanding existing ones. Some analysts say the shortage will be over soon, to be followed by a glut (see Polysilicon Prices Head for a Steep Fall). SolarWorld, a large solar panel maker in Germany, told analysts it sees no reason to invest in UMG silicon. "The company sees limited success of UMG and believes that it makes no sense to invest in the industry thanks to lower cost polysilicon coming online," wrote Jesse Pichel, an analyst with Piper Jaffray. Meanwhile, UMG silicon producers, such as Timminco and Dow Corning, also have been planning and building manufacturing plants. Interest in UMG silicon rose over the last three years when the solar and microprocessor industries competed fiercely for polysilicon. But the number of UMG silicon players remains small as they work out technological hurdles that have prevented them from being widely accepted. UMG silicon can't convert sunlight as well as polysilicon. Removing impurities such as boron and phosphorous, which can degrade solar panel performance, is a major obstacle. Some companies are blending the two to raise the efficiency. That leaves UMG silicon businesses to count on low selling prices as their biggest weapons. "What will matter is how much cheaper the modules are, and whether that is enough to entice customers to take on the risk of a new product," said Travis Bradford, president of the Prometheus Institute, a research partner with Greentech Media. Timminco hasn't met the goals it's set for lowering production costs. The company talked about making UMG silicon at CAD$10 to CAD$15 per kilogram, which would be less than half of the cost of producing polysilicon. But the company was able to do it only for CAD$31 per kilogram in the most recent, third quarter, Merer noted in his research note. In the second quarter, the production cost was CAD$32 per kilogram. Although it wasn't able to drive down the manufacturing cost quickly, Timminco's selling prices fell by 18.5 percent quarter over quarter to reach CAD$53 per kilogram, from CAD$65 per kilogram. That might be good for its customers, but not so for Timminco's earnings. Those prices are a quarter to roughly 50 percent less than the estimated long-term contract prices for polysilicon in 2008, depending on which market research you use. Timminco will have to improve its production efficiency and carry out its manufacturing expansion plans smoothly. The company announced a production delay earlier this year (see Timminco Shares Fall on Production Delay). Its competitor, Norway-based Elkem, faces the same trouble and won't be able to fulfill its contract with Q-Cells. 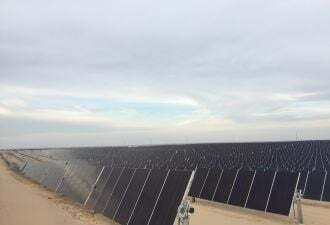 Ultimately, Timminco's success will be tied to Q-Cells, which plans to produce two thirds of its solar cells using UMG silicon starting in 2010, said Henning Wicht, an analyst with market research firm iSuppli. Timminco first announced its deal with Q-Cells in March this year, and is now due to supply the German company through 2013. "Q-Cells is the benchmark," Wicht said. "Q-Cells is quite good already at producing cells with UMG. If it succeeds, then it will cause others to change strategies." Q-Cells's CEO, Anton Milner, told analysts recently the polysilicon prices aren't falling fast enough, so its investments in UMG silicon is still a good strategy. To be sure, despite technical and manufacturing hurdles, UMG silicon firms have managed to attract a small but growing number of customers. Trina Solar, a long time maker of polysilicon-based equipment, announced last week that it will begin producing solar panels using UMG silicon (see Trina Joins UMG-Silicon Play). CaliSolar, a Sunnyvale, Calif.-based startup that makes solar cells out of UMG silicon, recently raised a large round to expand its business (see CaliSolar Snags $101.9M for UMG-Silicon Cells). With an economic climate that has injected fear into solar companies, however, UMG silicon players can expect a rocky year ahead.